But it’s a simple truth: novelty is key in the quest for amazement. So maybe, instead of boring cereal for breakfast, you should splurge and make some buttermilk pancakes courtesy of our favorite celebrity chef/former convict. Mind you, I say that with love; I “heart” Martha. Her magazine is fantastic and full of good ideas. And let’s not forget about her beautiful cupcake cookbook. These pancakes are surprisingly easy, require dirtying only one bowl and are perfect–in terms of both taste and consistency. 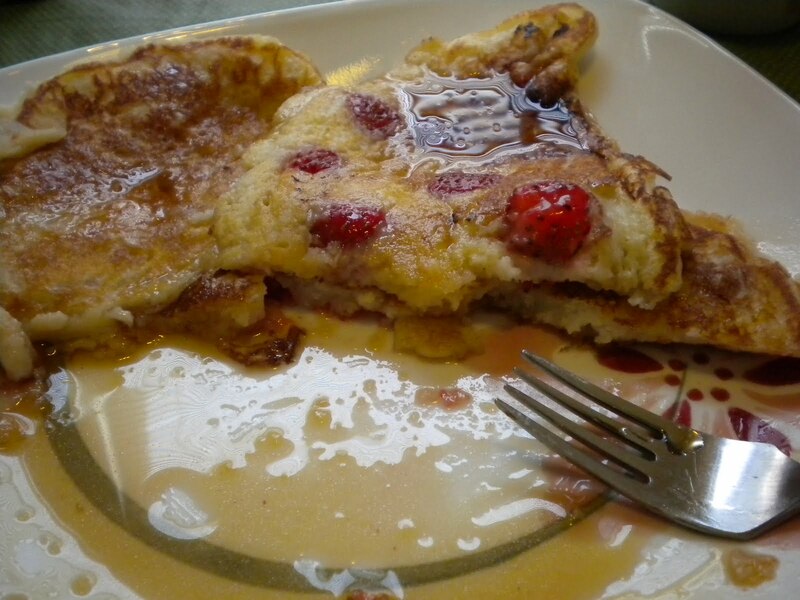 I had some rapidly aging strawberries and, as per usual, they make things only better. Also, if you, like me, were breakfasting alone, it’s an easy recipe to halve. Sometimes, Sundays, the long-forgotten day of rest, need to be honored. Especially since work, for better or for worse, will always be waiting in the wings. So, why not see “The Social Network” with some friends and bask in both the snark of Aaron Sorkin’s dialogue and the Facebook creation myth? And then have a Dark and Stormy (your nod to Mother Nature) and a yummy dinner of Buttermilk Fried Chicken with Sweet Potato Mash at Angeline’s Kitchen with a lovely Greek family? Definitely not the makings of the typical work-filled Sunday. Best of all, maybe you decide to finally get over yourself and your fears of what your students might think about you and your class and, by giving them the mid-semester course evaluations, actually find out what they think about both. You might realize that your fears have been misplaced and have (again) been subject to your own outrageous and impossible standards of excellence, while, in good old reality, your students are generally pleased. Some may actually say it’s their favorite class this semester and that they like the various “perverted” texts you’ve given them. =P And you know what? Because it’s anonymous and they have nothing to gain, you’ll believe them and be both humbled and gratified. It’s a nice feeling. -Cover the base of the baking dish with an ample amount of olive oil. 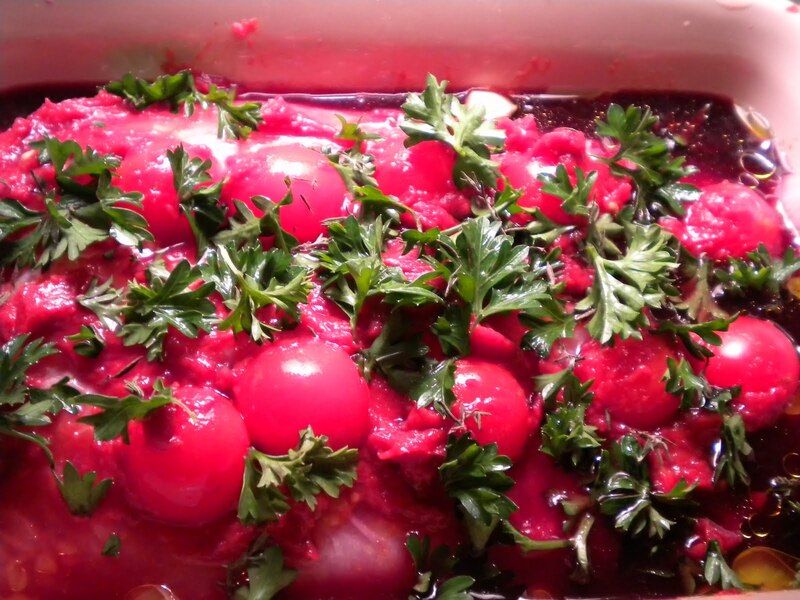 -Place the filets in a baking dish and then add the chunks of garlic. 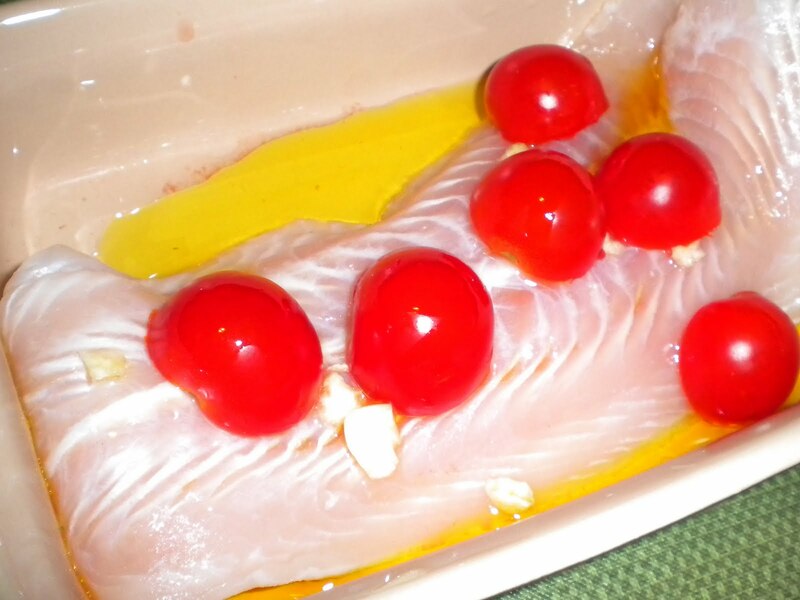 -Next, place the sliced cherry tomatoes on top of the filets. 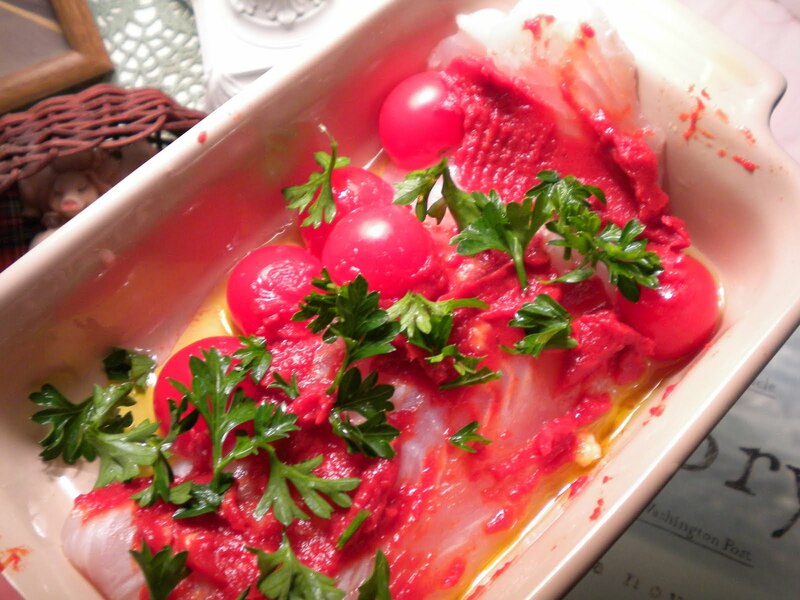 Apply the tomato paste around the tomatoes, being sure to cover the “exposed” areas of the filets. -Sprinkle the filets with parsley and thyme. 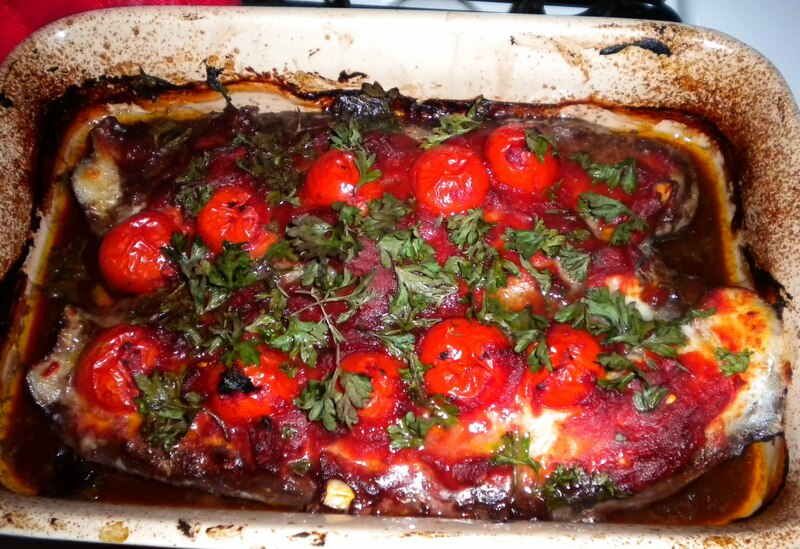 -Add a liberal amount of red wine to the olive oil base. 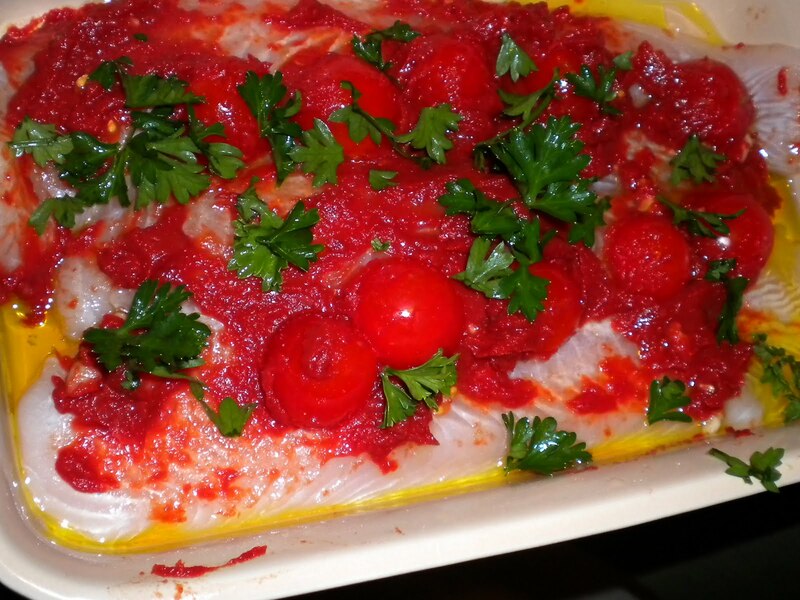 -Bake for about 35-40 minutes or until the fish flakes.